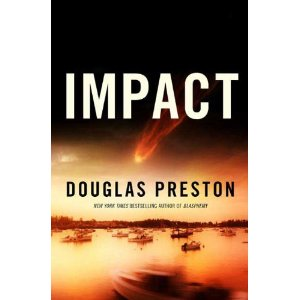 Impact by Douglas Preston | What a book! All right, last Douglas Preston book (since it’s his latest and I’m now caught up). Remember what I said about thrillers being silly? This one can be silly. Once again, just shut up, read and enjoy the ride. That ride started out a little slowly for my taste. In fact, the book, which once again features former CIA operative/monk Wyman Ford, is divided in two parts, and the setup part, Part I, seemed to go a little slow, even introducing some characters that I didn’t see too much point for having, while not developing other characters who eventually figured prominently in Part II. As usual, Preston mixes action with science and even ventures into sci-fi territory. But like I said, just relax and enjoy the ride. I’m still not sold on Wyman Ford as a main character yet. He still seems kind of thinly drawn after three novels, two of which belong to him. Perhaps that’s the intention, as he’s a CIA guy, designed to blend in and play any role. Also in this book, the final reveal of who the actual villain seemed a little too last minute and tidy, kind of a villanus ex machina, I guess. But that said, this is still a fun read. Also interesting is the story of a trip he took to Cambodia for National Geographic that helped inspire this story. Douglas Preston and Lincoln Child’s website.